The two volumes give, in an inspiring language, the march of true religion as conceived and propounded by sages and seers of all countries and climes in their search for truth and reality about the divinity, origin and true purpose of life. It paints o0n a vast canvas the story of the concept of soul, its spiritual content and ultimate Reality. 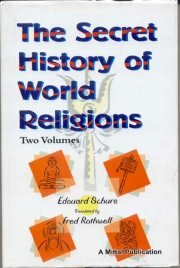 The sages and theosophists chosen for comprehensive discussion inthis book are:Krishna, Bouddha, Zororaster, Hermes, Moses, Pythagoras and Jesus.Volume 1 gives an account of the esoteric teachings of Rama (The Aryan Cycle), Krishna (India and the Brahmanic Initiation). Hermes (The Mystries of Egypt), Moses (The Mission of Isreal) and Orpheus (The Mystries of Dioysos). Volume 2 Gives Esotric teachings of Pythagoras (The Delphic Mystries) Plato (The Mystries of Elusis) and Jesus Christ (The Last Great initiate).